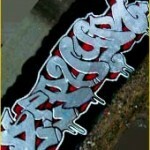 Called “The elder statesman of graffiti” by the New York Times, Zephyr has been doing graffiti for over 30 years. Starting in the mid-70’s and becoming one of the most prolific and celebrated subway bombers in the 80’s he designed the title for the seminal film Wild Style, which has been copied by aspiring graffiti writers all over the world. In addition to his graffiti, he is the author of countless articles on graffiti and the book Style Master General: The Life and Work of Dondi White (Harper Collins, 2001). 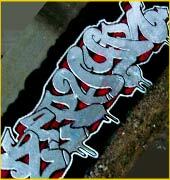 He also maintains an extensive website which chronicles the history of New York City graffiti. Zephyr resides in an undisclosed location and has an uneasy truce with the NYC Vandal Squad.